Most people know that the Parthenon in Athens was a pagan temple. Fewer know that it was also, at one time, a mosque. Islam came to Greece at the invitation of the Byzantine Empire to curb the Serbs and thus the Muslims stayed for over 500 years and as late as 1913, 40 percent of the population of Macedonia was Muslim and in many parts of Thrace, Greek-Islamic architecture is cleary visible. There are many different Muslim ethnic groups in Greece, namely the Pomaks, ethnic Turks, certain Roma groups, Greek Muslims and recently new immigrants from across the Muslim world. Today, up to 20% of Cyprus is Muslim. 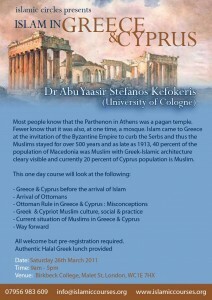 Dr Abu Yaasir Stefanos Kefokeris *Dr Kefokeris is Greek and after many years of studying various religions and lifestyles he accepted Islam in 1992. A polyglot, majored Political Science and Phd in “Islamic Heritage in Europe” from the University of Cologne. He has travelled extensively across the world, and is a Director of a travel agency called StudyTours Ltd. 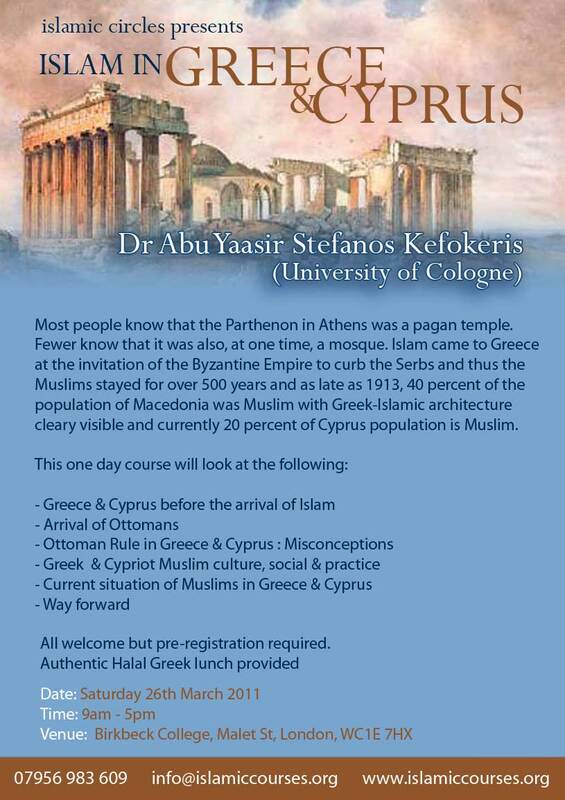 He has keen interest in the development of Islam and Muslims in Greece, and has beem lecturing for the last 15 years through an organisation called Greekmuslims and will be holding a major conference in Athens in May, hightling the Islamic Heritage of Greece.